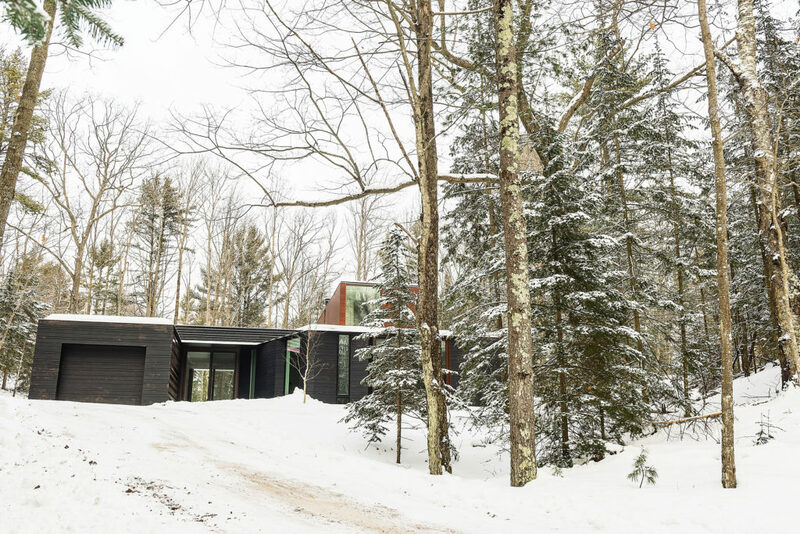 A green roof of sedum creates an effect similar to an infinity pool, blending the home into the vegetation covering the surrounding dunes in summer, and the snow-covered landscape in winter. Photo by John J. Macaulay. When MaryGrace Quinlan decided to build a getaway on her family’s property in Whitefish Bay, she had a high creative bar to clear. After all, in 1950 her father had built the family cottage down the road, followed by one of the state’s most curious homes a few driveways south in 1978. Some call it the Mushroom House, a nod to its curved exterior walls and gently rolling rooflines. Others call it the Hobbit House because it’s built into and enveloped by the sand dunes. The family calls it the Dome House. For her home, Quinlan turned to architect Brian Johnsen of Milwaukee’s Johnsen Schmaling Architects, after she saw his work on a home in Racine. Quinlan and her husband Kurt Wagner gave Johnsen just a few guidelines. Johnsen spent most of a year working on concepts, returning with a stunning design that mimics the landscape of the dunes where it’s nestled. The entire home features just a single interior door. Photo by John J. Macaulay. Floor-to-ceiling windows blur the line between inside and outside, basking the center of the home in natural light. Photo by Len Villano. 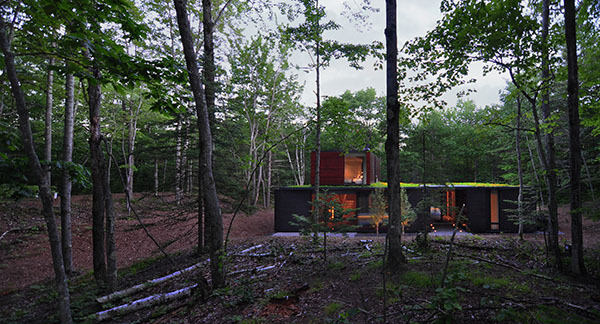 The home is built to blend into the surrounding dunes of Whitefish Dunes State Park. Photo by John J. Macaulay. 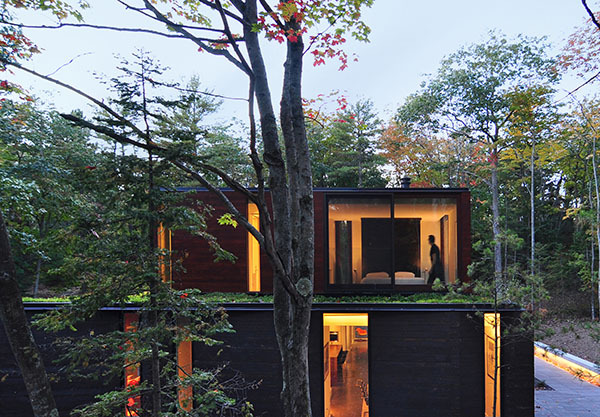 The undulating exterior walls of ‘The Pleated House’ mimic the grooves in the bark of the surrounding trees. Photo by Len Villano. 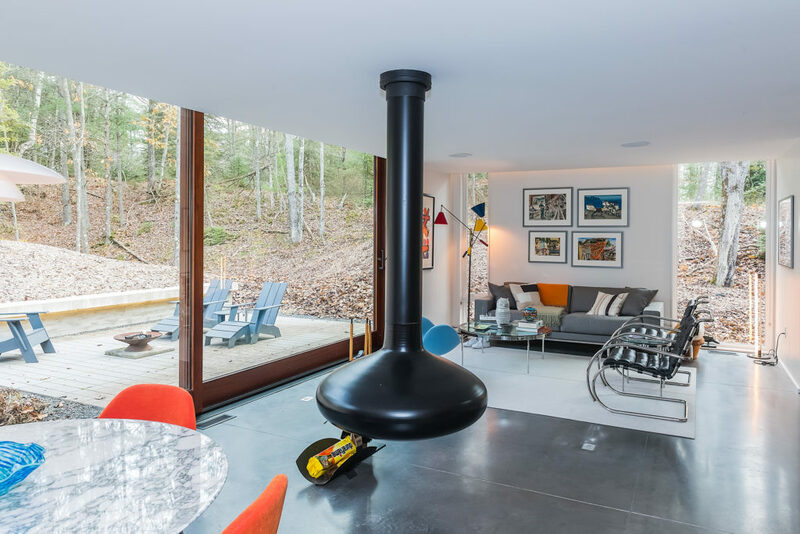 The hanging fireplace in the center of the home is an ode to the fireplace Quinlan’s father built in the original family cottage across the road (as pictured in the The new fireplace rotates 360 degrees. The original fireplace Quinlan's father built in their first Door County cottage. Submitted. A steel staircase supported by metal rods descending from the second story. Photo by John J. Macaulay. The Pleated House in Winter. Photo by Len Villano. The home is located on Mickey Way, a private drive named for Quinlan's mother. Photo by Len Villano. 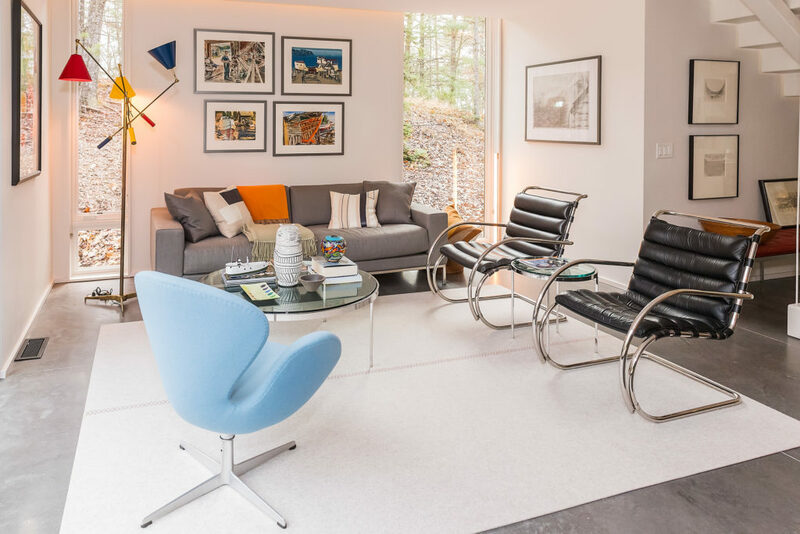 The home is decorated in minimalist style, including two Mies van der Rohe MR chairs. Photo by Len Villano. 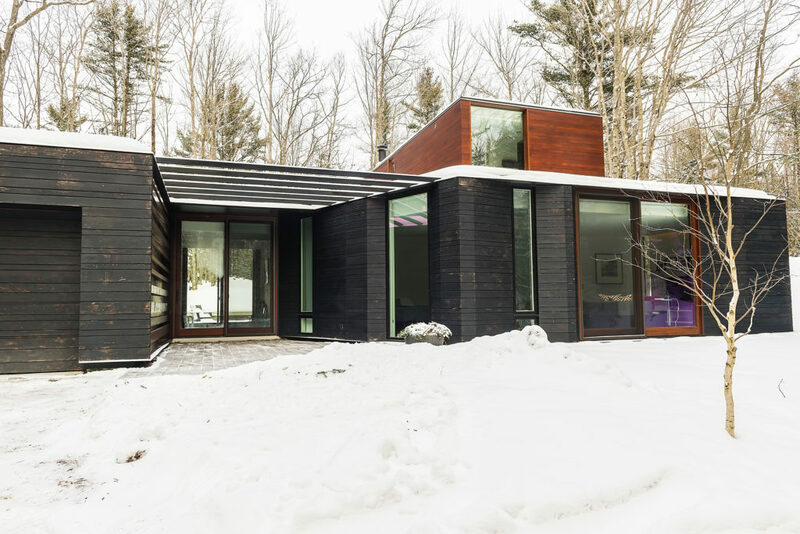 Pulling in the driveway, a visitor is struck by the undulating exterior walls framing floor-to-ceiling windows. 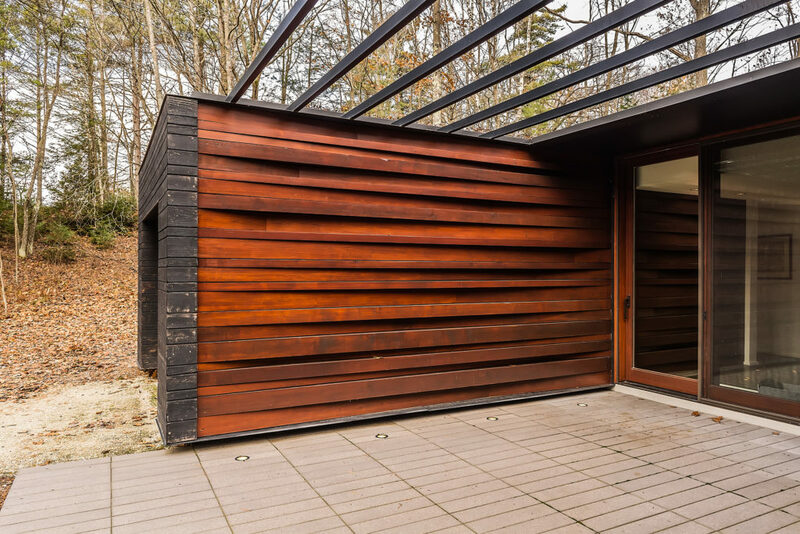 The walls are made of charred cedar, a look created onsite using a burning technique that not only darkens and textures the wood, but makes it decay- and bug-resistant with a final look reminiscent of the bark that covers the surrounding tree trunks. 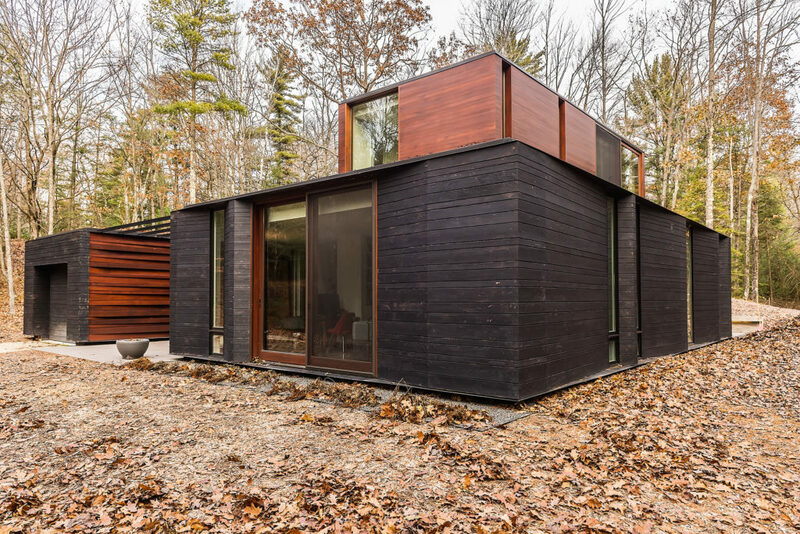 The windows are situated so one can see clear through to the other side of the home from each side of the structure, creating an effect that blurs the boundaries between indoor and outdoor, accentuated by a trellised entryway of stacked, varnished lumber. Inside you find a stark contrast to the dark exterior in its bright, white walls and a gray polished concrete floor that only serve to accentuate the colors of the surrounding foliage as it evolves with the seasons. Though only 1,700 square feet, the interior space feels larger thanks to the fact that the home features a single interior door. The main wall of the living space is a floor-to-ceiling sliding door that is open most of the summer. With the doors open and the screen pulled, one can relax to the sound of waves rolling in to the shore across the road. Those windows presented a challenge for Keith Tielens, the local contractor who built the home. Tielens embraced Quinlan’s challenge of building a modernist home that paid homage to the cottage and otherworldly designs of her father, Albert Quinlan. Her family first came to Whitefish Bay as part of a wave of St. Louis residents who flocked to the county to escape the stifling summer humidity along the Mississippi in the 1940s. The Danis family came first and pulled the Quinlans, who rented a cottage for several years before buying a property down the road. 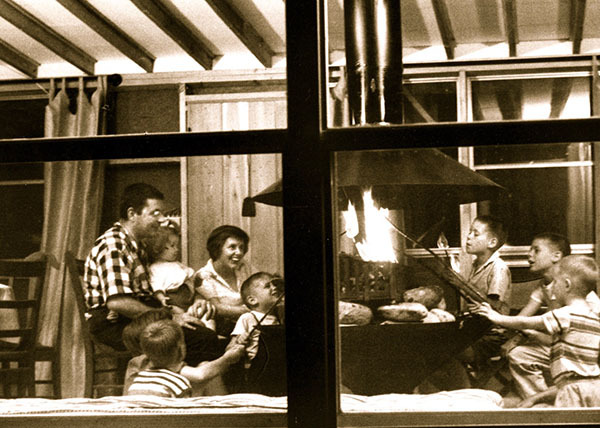 Albert began building a home in 1950 that would become a cherished getaway for his wife, Margaret, and their 11 children. The members of the St. Louis colony didn’t see much of each other in their home city, but come summers they formed a tight-knit community. “I think of my mother and my father every day here,” she said. That’s not by accident. 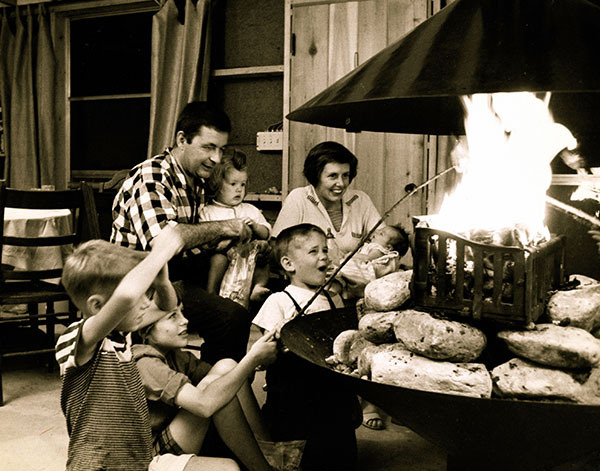 In his first home Albert Quinlan built a 360-degree fireplace in the center of the cottage, a warm gathering space where the entire family of 13 could sit around the fire. In MaryGrace’s home a fireplace hangs — yes, hangs — in the center of the room. The fireplace rotates 360 degrees to face wherever people might be gathered in the room. The space is filled with mid-century furniture, some sourced from her brother, a furniture maker in Chicago’s Ukrainian Village neighborhood. Other pieces, such as the Mies van der Rohe MR chair, she has had for decades. Here, even the staircase is a work of art. Designed by Ritchie Metal Works of Green Bay, the steel staircase hangs from the second-story ceiling supported by a filigree of vertical rods. The stairs lead to the master bedroom cased, in sprawling windows that make you feel as though you could walk straight out onto the dunes around you. 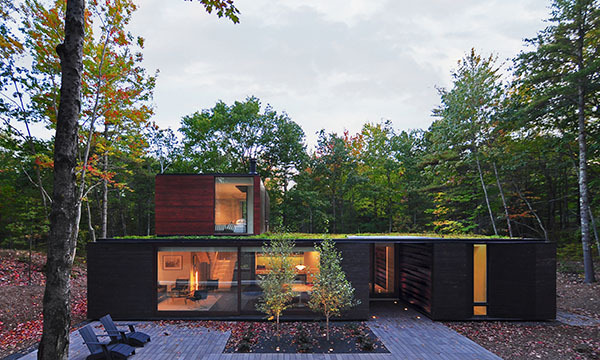 Facing east, a grass roof of sedum extends before you like an infinity pool that changes with the seasons, evoking the natural roof that engulfs her father’s Dome House, and linking a daughter to father.